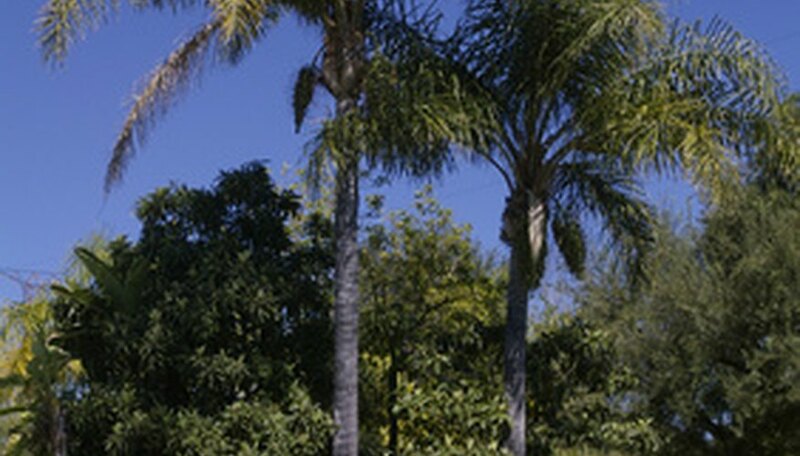 Palm trees are used in landscaping in Florida and California. There are several types of palm trees, including the coconut palm, and all palms are susceptible to certain diseases. These diseases can affect the population of the palm trees if they are not controlled and treated. To help with the control of diseases, choose cultivars that are disease resistant, if a disease is known to be a problem in your locale. Ganoderma zonatum is a bracket fungus recently identified by scientists at the Fort Lauderdale Research and Education Center at the University of Florida. The disease was first identified in 1994, and it attacks only mature trees. Symptoms include withering and drooping of the older fronds, which turn brown but do not fall off the trunk. Ganoderma zonatum also slows growth, and the new growth is pale green. The palm dies within six to 12 months. According to the University of Florida, there is no cure for the disease and infected trees must be removed to prevent contamination of nearby, healthy trees. Pink rot, identified in 1923 in Belgium, is a fungus that ranges in color from flesh to rose. The disease seemed to be dormant for many years until it was identified again in 1989 on Phoenix palms. Gliocladium vermoeseni is the fungus that causes pink rot. The spores of the fungus are always present where palms are grown, but it needs a wound or a very stressed plant to infect the plant. It also affects older palm trees that grow slowly. Control pink rot by taking care not to wound a tree. Plant cultivars that are not susceptible to pink rot, such as 'Washingtonia filifera' if you are along the coast with higher humidity. Fungicides also prevent pink rot and should be used on older trees. According to the University of California, Thiophanate-methyl is the fungicide most often used for pink rot. Biotic diseases are rare, according to the University of California, but do affect older trees or stressed trees. The pathogens might produce different diseases, or could produce specific diseases on specific palms. The Fusarium oxysporum f.sp. canariensis produces wilt disease on the Canary Island date palm. Treatment depends on the type of biotic disease that affects the palm tree. Be sure to get the appropriate fungicide for the proper biotic disease. There are several root rots, including Phytophthora spp. and Armillaria spp., that affect palm trees. Root rots are caused by various conditions. To check for root rot, take a culture of the fungus from the roots and have it tested at a lab to determine which fungus is infecting the tree. Root rots cause slow growth, yellowing of the fronds, and eventually, death of the tree. Most fungus is treated with fungicides. Diamond scale is most commonly treated with thiophanate-meythl (Clearys 3336, according to the University of California). Copper-based fungicides might also be used on various fungus infections. Cayden Conor has been writing since 1996. She has been published on several websites and in the winter 1996 issue of "QECE." Conor specializes in home and garden, dogs, legal, automotive and business subjects, with years of hands-on experience in these areas. She has an Associate of Science (paralegal) from Manchester Community College and studied computer science, criminology and education at University of Tampa. What Causes a Palm Tree to Fall?